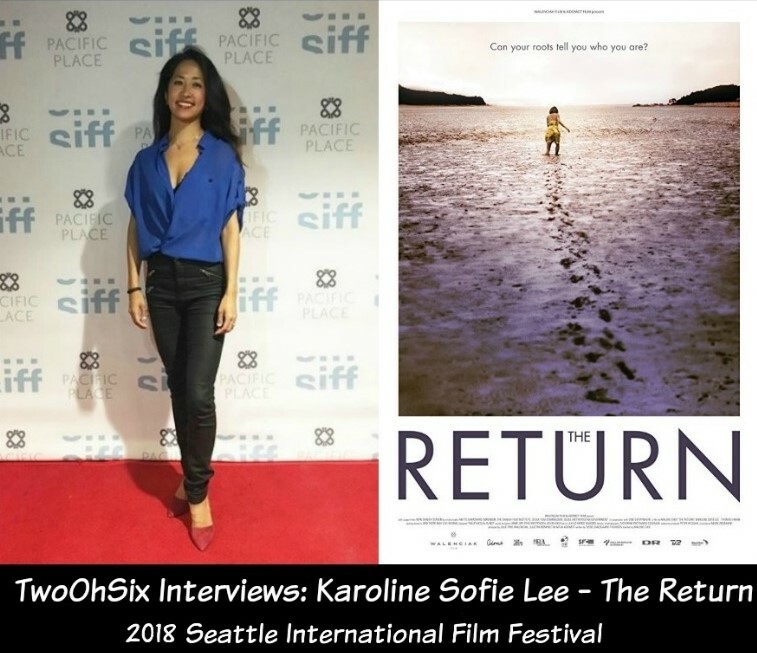 During the first weekend of the 2018 Seattle International Film Festival, I had the pleasure of interviewing Karoline Sofie Lee, the lead actress from The Return (TwoOhSix Review), a movie about two Korean born adoptees returning from their homes in Denmark in a quest to find their birth parents. We chatted about how she was hired for the role, making such a unique movie, and her own personal experience with the subject matter. Hi Karoline, welcome to the Seattle International Film Festival! Have you been to Seattle before? No, this is my first time. Yesterday, I got to see a little bit of the city including the MoPop (Museum of Pop Culture) but unfortunately I am already leaving tomorrow. The Return is very unique in how the story is told. Tell me how you first got involved with the project. I saw online, on Facebook, where they were looking for an actress who is a Korean adoptee so I just went to the casting. I think I was the last person they invited for the casting and a week later they called me back and said they really hoped that I would say yes so that was really amazing. How much were you able to bring from your personal experience to the character? It's not my story at all but I've been through a similar journey. I had to use myself a lot because the director (Malene Choi) had mainly been doing documentaries so she wanted to portray this as realistic as possible. For many of the scenes I had no script and she just told me that my character should have this feeling and the scene should go that way so I just went with it. This was my first movie so everything was totally new to me but I really loved it and embraced it and I want to do more. Given the unique style of film where it's a fictional story presented as a documentary, did the director give you specific instruction on how she wanted you and the rest of the cast to occupy the space created for each scene or was it more like here's the idea now go create? It was really the latter so I had to use myself a lot, the whole way through the movie. The thing about playing this role, I had to take the feelings and the emotions that came to me and then choose to go with them but only to a certain point. In some of the scenes I had to use myself one hundred percent and that was very hard. I had to balance the whole time to be the character but still be affected by what came up so it was like improv the whole time. To me, a lot of the story telling was in facial expressions, gestures, and glances. Some of that was scripted. For instance there was a moment where Thomas was glancing at me, the director had told him that, at some point, you have to look at Karoline but the dialog was really free and up to us. Did you and your co-lead, Thomas Hwan have an opportunity to share your personal stories and get to know each other off set? We had a lot of late night talks. I think it was important for us both to be able to act together but also because we just needed to talk about all these feelings and experiences we had. We had different experiences being in Korea and relating to Korea, but I think our emotions about being adoptees are very similar and how we don't really belong anywhere. How much did your real life experience of trying to find your parents compare to the story being told in the movie? I had been to Holt, the agency that was used in the movie, a couple times before. I went to Korea with this organization and they helped me a lot so my personal story was not like what Karoline was living in the movie, but the feelings, and all the thoughts, and the impressions, they are very similar. The two scenes in Holt, that's my papers, my original papers from when I was there looking for my parents. When was the first time you went back to Korea? The first time was back in 1998, I was only 15 years old. There had to be a lot of expectation for what it might be like. Yeah, when you are a teenager, you are constantly thinking who am I and who would I like to be and especially when you are adopted because you know you are from somewhere else and you don't look like the majority in your country. When I was 15, I didn't feel comfortable in Denmark, I didn't feel that this was where I belong and also because I had been told you are from somewhere else, you should go back to where you come from. I had this expectation that I would go back to Korea and I would feel at home, I would feel at ease, I would feel good, but when I got there, I felt like a total stranger so that was kind of a shock for me. How much time did you spend in Korea? Did you develop any sort of comfort level with the culture? I was there with my adopted family for 14 days. We went with this group on this culture journey so we were introduced to the culture and a lot of sites but I actually don't really remember much because I think I was too young to go. It was good for me to go again in 2015 for another search and then again in 2016 for the movie. What is the biggest thing you learned from this being your first acting experience? That is definitely to stay true to myself because I see a lot of actors "acting" a lot because they want to portray a certain feeling or be in a character so I get this acted up feeling. What I find interesting as an actress is to be able to portray something very realistic so I think that would be my strength. I learned from this movie that I have some sort of talent and I should just believe in myself. I think when you are an untrained actor and you haven't been doing a film before, you can get insecure. I have wanted to be an actress since I was a child but I grew up in a very conservative family and because I have Asian looks, I didn't go that way. I went to University instead but this dream still lived in me and I learned that I should just follow my heart. You also have a background in dancing. Is there anything that translates from one type of performing to the other? Yes, I feel comfortable on stage so I can be natural when there's a camera in my face. I don't feel shy and I can just be natural, be myself. Considering the range of emotions tied to being an adoptee and going through the journey you portray in the story, what is something you would like people to learn from watching the film? It's very interesting that I am able to do this movie now. I have a Master's degree in communications, it's called "Psychology of Language", and when I did my thesis I was focusing on racism from the perspective of Korean adoptees in Denmark. One of the things that is difficult for us as adoptees is how people will ask very personal questions as soon as they hear that we are adopted. Questions like have you gone back to Korea to find your family and do you want to but it's actually very personal. In the film, you can see it, there's a lot of difficult feelings combined with this so the message would be to be more cautious about what you ask about. It's life, it's feelings, and yeah it's difficult. That's all the time we have, thank you for talking to me today. Good luck with the film and I hope you enjoy your time in Seattle. TwoOhSix.com review of The Return. The Return is an official selection of the 2018 Seattle International Film Festival.